Phenylketonuria (PKU) is a genetic disorder characterized by a deficiency in, or problem with the proper activity of, the enzyme phenylalanine hydroxylase (PAH), which is necessary to metabolize the amino acid phenylalanine to the amino acid tyrosine. If untreated, phenylalanine accumulates and can result in neurological problems, including mental retardation and seizures. PKU is sometimes called Folling's disease. PKU is one of the few genetic diseases that can be controlled by diet, involving low consumption of phenylalanine and a diet high in tyrosine. Women affected by PKU must pay special attention to their diet if they wish to become pregnant, since high levels of phenylalanine in the uterine environment can cause severe malformation and mental retardation in the child. However, women who maintain an appropriate diet can have normal, healthy children. The intricate coordination of systems in the human body is seen in the process, catalyzed by enzymes, by which phenylalanine is degraded into tyrosine, which in turn is converted into the vitally important neurotransmitters and hormones dopamine, norepinephrine (noradrenaline), and epinephrine (adrenaline). However, a mutation in one particular gene, the one responsible for producing the enzyme PAH, can result in the disruption of this harmony, as the body loses its ability to metabolize phenylalanine. Phenylalanine is an α-amino acid that is found in many proteins (such as hemoglobin), is essential in the human diet, and normally is readily converted to the amino acid tyrosine in the human body. In humans, the L-isomer of phenylalanine, which is the only form that is involved in protein synthesis, is one of the 20 standard amino acids common in animal proteins and required for normal functioning in humans. Phenylalanine also is classified as an "essential amino acid" since it cannot be synthesized by the human body from other compounds through chemical reactions and thus has to be taken in with the diet. L-phenylalanine can be converted into L-tyrosine, another one of the DNA-encoded amino acids. 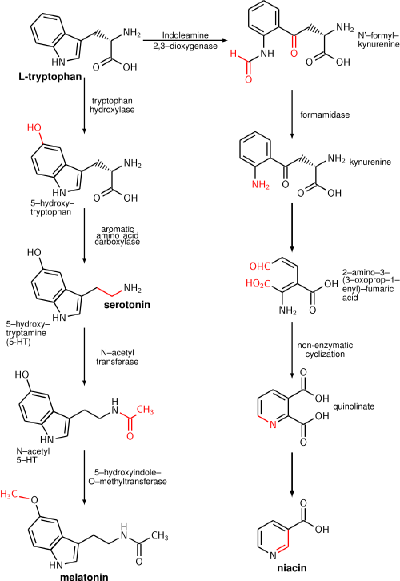 L-tyrosine, in turn, is converted into L-DOPA, which is further converted into dopamine, norepinephrine (noradrenaline), and epinephrine (adrenaline). Dopamine, norepinephrine, and epinephrine are known as catecholamines. 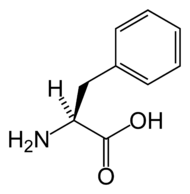 Catecholamines are any of a group of amines (nitrogen-contain organic compounds) derived from the amino acid tyrosine and containing a catechol group (aromatic chemical compound consisting of a benzene ring with two hydroxyl groups). Catecholamine are important as neurotransmitters and hormones. Tryosine, one of the main precursors of catecholamines, is created from phenylalanine by hydroxylation via the enzyme phenylalanine hydroxylase. (Tyrosine also is ingested directly from dietary protein). Tyrosine is oxidized into dihydroxyphenylalanine (L-DOPA). Next is β-oxidation into norepinephrine by dopamine beta hydroxylase. Epinephrine then is synthesized from norepinephrine via methylation of the primary distal amine of norepinephrine by phenylethanolamine N-methyltransferase (PNMT). The enzyme phenylalanine hydroxylase (PAH) is fundamental to the process through conversion of amino acid phenylalanine into the amino acid tyrosine. This is the only known role of PAH in the human body (Krapp and Wilson 2005). The enzyme phenylalananine hydroxylase (PAH) is necessary to break down phenylalanine. However, a genetic mutation in the gene that is necessary for producing PAH can result in no, or poor quality, enzyme being made. The gene for phenylalanine hydroxylase is found on chromosome 12 (Longe 2006). There are many different mutation sites, which can lead to a range of errors in the enzyme, including lack of the enzyme (Longe 2006). Phenylketonuria is an autosomal recessive genetic disorder. This means that a child must inherit abnormal genes from both parents to develop PKU (Longe 2006). People with one gene are carriers because they do not have the disease, but can pass it on to their children. If the reaction converting phenylalanine to tyrosine does not take place, because of the lack of PAH or a defect in this enzyme, then phenylalanine accumulates and tyrosine is deficient. Phenylketonuria is the inability to metabolize phenylalanine. Abnormally high levels of phenylalanine are toxic to cells of the nervous system. Other factors, such as the lack of a particular coenzyme, can also impact the expression of PAH and cause elevated phenylalanine levels. Excessive phenylalanine can be metabolized into phenylketones, which are detected in the urine. These include phenylacetate, phenylpyruvate, and phenylethylamine (Michals and Matalon 1985). Detection of phenylketones in the urine is diagnostic. Phenylalanine is a large, neutral amino acid (LNAA). LNAAs compete for transport across the blood brain barrier (BBB) via the large neutral amino acid transporter (LNAAT). Excessive phenylalanine in the blood saturates the transporter. Thus, excessive levels of phenylalanine significantly decrease the levels of other LNAAs in the brain. But since these amino acids are required for protein and neurotransmitter synthesis, phenylalanine accumulation disrupts brain development in children, leading to mental retardation (Pietz et al. 1999). There is also a lack of dopamine and other neurotransmitters whose synthesis traces to tyrosine. Since phenylalanine uses the same active transport channel as tryptophan to cross the blood-brain barrier, in large quantities it also interferes with the production of serotonin, which is a metabolic product of tryptophan. Children appear normal at birth, but if not treated early, will develop irreversible mental retardation (Longe 2006). Phenylketonuria was discovered by the Norwegian physician Ivar Følling in 1934 (Folling 1934), when he noticed that hyperphenylalaninemia (HPA) was associated with mental retardation. In Norway, this disorder is known as Følling's disease, named after its discoverer (Centerwall and Centerwall 2000). Dr. Følling was one of the first physicians to apply detailed chemical analysis to the study of disease. His careful analysis of the urine of two retarded siblings led him to request many physicians near Oslo to test the urine of other retarded patients. This led to the discovery of the same substance that he had found in eight other patients. The substance found was subjected to much more basic and rudimentary chemical analysis. He conducted tests and found reactions that gave rise to benzaldehyde and benzoic acid, which led him to conclude the compound contained a benzene ring. Further testing showed the melting point to be the same as phenylpyruvic acid, which indicated that the substance was in the urine. His careful science inspired many to pursue similar meticulous and painstaking research with other disorders. PKU is a rare metabolic disorder. The incidence of PKU is about 1 in 15,000 births, but the incidence varies widely in different human populations from 1 in 4,500 births among the population of Ireland (DiLella et al. 1986) to fewer than one in 100,000 births among the population of Finland (Guldberg et al. 1995). The high incidence in Ireland, which is the highest known in the world, supports a theory that the genetic defectis old and of Celtic origin (Longe 2006). Countries with little immigration from Ireland and western Scotland tend to have low PKU rates (Longe 2006). Caucasians in the United States have a PKU incidence of 1 in 8,000, while Blacks have a rate of 1 in 50,000. PKU is normally detected using the Guthrie test, part of national biochemical screening programs. It is critical to detect PKU shortly after birth. Screening is the only method to detect PKU prior to appearance of symptoms (Longe 2006). If a child is not screened at birth (e.g. in home deliveries), the disease may present clinically with seizures, albinism (excessively fair hair and skin), and a "musty odor" to the baby's sweat and urine (due to accumulation of phenylacetate, one of the ketones produced). Untreated children are normal at birth, but fail to attain early developmental milestones, develop microcephaly, and demonstrate progressive impairment of cerebral function. Hyperactivity, EEG abnormalities and seizures, and severe mental retardation are major clinical problems later in life. Patients with PKU tend to have lighter pigmentation of skin, hair, and eyes that other members of the family, and are likely to have eczema (Longe 2006). Unless treated early, there is irreversible mental retardation. In contrast, affected children who are detected and treated at birth are less likely to develop neurological problems and have seizures and mental retardation, though such clinical disorders are still possible. Classical PKU is caused by a defective gene for the enzyme phenylalanine hydroxylase (PAH), which converts the amino acid phenylalanine to other essential compounds in the body. The genetic mutations result in no enzyme being produced, or a defective enzyme that is of poor quality. The PAH gene is located in band 12q23.2 on chromosome 12. More than four hundred disease-causing mutations have been found in the PAH gene (Arora 2007). 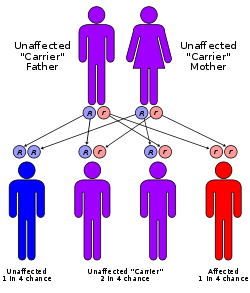 As an autosomal recessive genetic disorder, involving a recessive allele located on chromosome # 12, each parent must have at least one defective allele of the gene for PAH, and the child must inherit two defective alleles, one from each parent. (Autosomal means that the gene is located on a chromosome other than the X or Y chromosomes.) As a result, it is possible for a parent with PKU phenotype to have a child without PKU if the other parent possesses at least one functional allele of the PAH gene; but a child of two parents with PKU will always inherit two defective alleles, and therefore, the disease. Phenylketonuria can exist in mice, which have been extensively used in experiments into an effective treatment for PKU (Oh et al. 2004). The macaque monkey's genome was recently sequenced, and it was found that the gene encoding phenylalanine hydroxylase has the same sequence which in humans would be considered the PKU mutation. Classic PKU involves a genetic disorder whereby no PAH enzyme is produced or it is defective. However, there are other cases involving high levels of phenylalanine. Krapp and Wilson (2005) state that classic PKU is the most serious disorder of a class of diseases known as hyperphenylalaninemia, all of which involve elevated levels of phenylalanine in the blood (Krapp and Wilson 2005). A rarer disorder than classic PKU involving elevated phenylalanine occurs when PAH is normal, but there is a defect in the biosynthesis or recycling of the cofactor tetrahydrobiopterin (BH4) by the patient (Surtees and Blau 2000). This cofactor is necessary for proper activity of the enzyme. This is known as tetrahydrobiopterin deficiency disease. Mild hyperphenylalaninemia involves patients with phenylalanine blood levels of less than 10 mg/dl, even when havng a normal diet between 0.6 and 1.5 mg/dl (Longe 2006). There may be few effects from this condition. A more severe hyperphenylalaninemia involves higher phenylalanine blood levels (above 10 mg/dl), which occur, unlike classic PKU, despite the presence of phenylalanine hydroxylase in the liver. In this case, the enzyme occurs at greatly reduced levels compared to normal persons (Longe 2006). These individuals require the same diet as classical PKU patients (Longe 2006). Tyrosinemia is characterized by high levels of both phenylalanine and tyrosine (Longe 2006). Many of the same symptoms as classical PKU may result. These patients must eat a diet low in both phenylalanine and tryrosine. Other, non-PAH mutations also can cause elevated phenylalanine (Arora 2007). Treatment of PKU includes the elimination of phenylalanine from the diet, and supplementation of the diet with tyrosine. Babies who are diagnosed with PKU must immediately be put on a special milk/formula substitute. Later in life, the diet continues to exclude phenylalanine-containing foods. If PKU is diagnosed early enough, an affected newborn can grow up with normal brain development, but only by eating a special diet low in phenylalanine for the rest of his or her life. This requires severely restricting or eliminating foods high in phenylalanine, such as breast milk, meat, chicken, fish, nuts, cheese, and other dairy products. Starchy foods such as potatoes, bread, pasta, and corn must be monitored. Many diet foods and diet soft drinks that contain the sweetener aspartame must also be avoided, as aspartame consists of two amino acids: Phenylalanine and aspartic acid. Supplementary infant formulas are used in these patients to provide the amino acids and other necessary nutrients that would otherwise be lacking in a protein free diet. Since phenylalanine is necessary for the synthesis of many proteins, it is required but levels must be strictly controlled. In addition, tyrosine, which is normally derived from phenylalanine, must be supplemented. In those patients with a deficit in BH4 production (a cofactor necessary for proper activity of the enzyme), or with a PAH mutation resulting in a low affinity of PAH for BH4, treatment consists of giving BH4 as a supplement; this is referred to as BH4 responsive PKU. There are a number of other therapies currently under investigation, including gene therapy, and an injectable form of PAH. However, it is likely that it will be many years before these are available for human use. Previously, PKU-affected people were allowed to go off diet after approximately 12 years of age. However, physicians now recommend that this special diet should be followed throughout life. For women affected with PKU, it is essential for the health of their child to maintain low phenylalanine levels before and during pregnancy (lee et al. 2005). Though the developing fetus may only be a carrier of the PKU gene, the intrauterine environment can have very high levels of phenylalanine, which can cross the placenta. The result is that the child may develop congenital heart disease, growth retardation, microcephaly, and mental retardation (Rouse et al. 1997). PKU-affected women themselves are not at risk from additional complications during pregnancy. In most countries, women with PKU who wish to have children are advised to lower their blood phenylalanine levels before they become pregnant and carefully control their phenylalanine levels throughout the pregnancy. This is achieved by performing regular blood tests and adhering very strictly to a diet, generally monitored on day-to-day basis by a specialist metabolic dietitian. When low phenylalanine levels are maintained for the duration of pregnancy there are no elevated levels of risk of birth defects compared with a baby born to a non-PKU mother (Pridjian 2007). Arora, N. 2007. Genetics of phenylketonuria: A comprehensive review. Retrieved August 3, 2007. Centerwall, S. A., and W. r. Centerwall. 2000. The discovery of phenylketonuria: The story of a young couple, two retarded children, and a scientist. Pediatrics 105(1 Pt 1): 89-103. DiLella, A. G., S. C. Kwok, F. D. Ledley, J. Marvit, and S. L. C. Woo. 1986. Molecular structure and polymorphic map of the human phenylalanine hydroxylase gene. Biochemistry 25: 743-749. Guldberg, P., K. F. Henriksen, I. Sipila, F. Guttler, and A. de la Chapelle. 1995. Phenylketonuria in a low incidence population: molecular characterization of mutations in Finland. J. Med. Genet 32: 976-978. Joh, T. H., and O. Hwang. 1987. Dopamine beta-hydroxylase: Biochemistry and molecular biology. Ann N Y Acad Sci. 493: 342-50. Retrieved August 2, 2007. Lee, P. J., D. Ridout, J. H. Walker, and F. Cockburn. 2005. Maternal phenylketonuria: Report from the United Kingdom Registry 1978–97. Archives of Disease in Childhood 90: 143-146. Michals, K., and R. Matalon. 1985. Phenylalanine metabolites, attention span and hyperactivity. American Journal of Clinical Nutrition. 42(2): 361-365. Oh, H. J., E. S. Park, S. Kang, I. Jo, and S. C. Jung. 2004. [http://www.pedresearch.org/cgi/content/full/56/2/278 Long-term enzymatic and phenotypic correction in the phenylketonuria mouse model by adeno-associated virus vector-mediated gene transfer. Pediatric Research 56: 278-284. Pietz, J., R. Kreis, A. Rupp, E. Mayatepek, D. Rating, C. Boesch, and H. J. Bremer. 1999. Large neutral amino acids block phenylalanine transport into brain tissue in patients with phenylketonuria. Journal of Clinical Investigation 103: 1169–1178. Pridjian, G. 2007. lsuhsc.edu Genetics and Louisiana families: Pregnancy and phenylketonuria (PKU)]. LSU Health Services Center. Retrieved August 3, 2007. Rouse, B., B. Azen, R. Koch, R. Matalon, W. Hanley, F. de la Cruz, F. Trefz, E. Friedman, and H. Shifrin. 1997. Maternal phenylketonuria collaborative study (MPKUCS) offspring: Facial anomalies, malformations, and early neurological sequelae. American Journal of Medical Genetics 69(1): 89–95. Surtees, R., and N. Blau. 2000. The neurochemistry of phenylketonuria. European Journal of Pediatrics 169: S109-113. This page was last modified on 21 December 2015, at 20:31.